Forces while in Clarendon, Texas. began a tour of duty in Vietnam on October 8, 1963. DEAN AMICK WADSWORTH is listed as Missing in Action. They are identified as Air Force Capt. 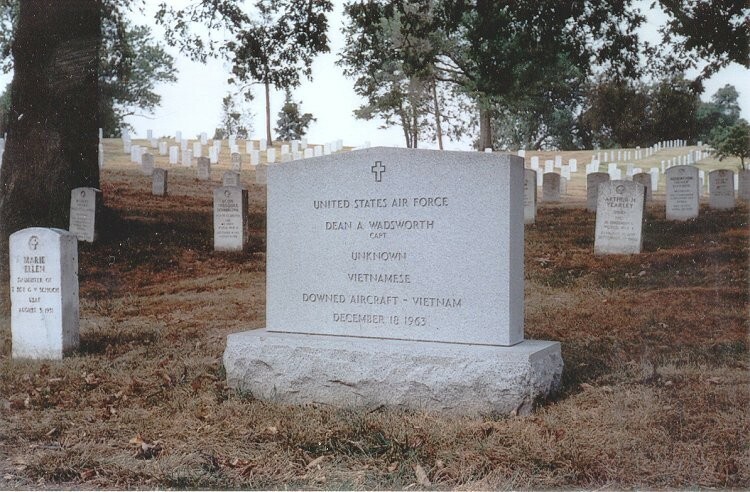 Dean A. Wadsworth, Clarendon, Texas; Marine SSgt. Harold E. Reid, Salt Lake City, Utah; Navy Lt. David L. Hodges, Chevy Chase, Md. ; Air Force Lt. Col. Lewis M. Robinson, Saginaw, Mich.; Air Force Capt. Douglas K. Martin, Tyler, Texas; and Air Force Capt. Samuel L. James, Chattanooga, Tenn.
area of the downed aircraft. As the helicopters landed, enemy troops fired on them, wounding three Marine crewmen and killing a Vietnamese soldier. Two T-28s, B-26s and a South Vietnamese A-1 aircraft responded by strafing enemy positions. An American L-19 light observation aircraft directing the strike was hit, the Vietnamese observer was wounded, and the aircraft made a forced landing. Meanwhile, the Vietnamese ground troops found both Marine helicopters that had disappeared on the first day. Ten bodies were recovered, but two remain missing in action to this day. In the days during the search and rescue operations, 207 missions were flow n, three aircraft were lost and four others damaged. Fifteen South Vietnamese soldiers were killed and seven were wounded. In late 1993, a Vietnamese local turned over remains he said were recovered near the crash site. In May of the following year, a joint U.S./Vietnamese team, led by the Joint Task Force-Full Accounting, visited the area of the crash, interviewed villagers and obtained some aircraft debris and pilot-related equipment. In September, another joint team examined the crash site and found more debris, but no remains. Then in May 1995, another team excavated the site where they found remains, as well as two identification tags of Wadsworth.